I wanted to reproduce this very simple infographic because I think it is accurate, helpful and meets my bias of not liking working out indoors at the health club. That doesn’t mean that you can’t do it and get worthwhile health benefits. I just really prefer doing it outdoors. I am reblogging this from 2011 as I have updated it and it has a lot of useful info for folks who are into outdoor activities. Regular readers know that I ride year ’round here in Chicago. Through November, we barely cracked 40 degrees F which didn’t call for much extra prep beyond gloves and ear covering. Come December, however, with the advent of the 30s a whole new dimension of cycling wear opens up. 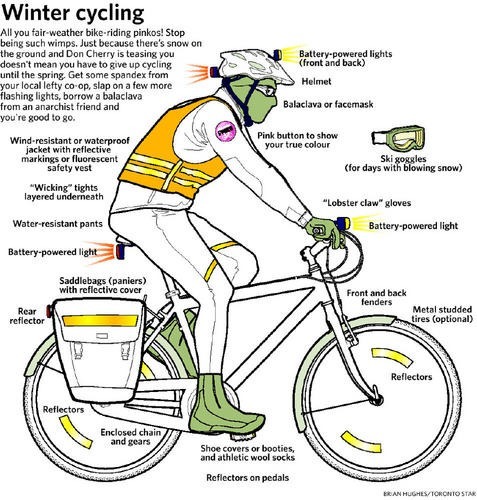 Whether you ride a bike or not, I think you will find some useful info here.